This is Andrew’s first appearance at the New Vic. Theatre credits include: If I Should Fall (Red Bobble Theatre); Brassed Off (York Theatre Royal and Bolton Octagon Co-Production); Alice (Theatre in The Quarter); Rid the world (Breathe Out Theatre); Some Voices, Look Back in Anger (Blackhand Productions); The Myth of Escape (Happystorm Theatre); The Tempest (Oldham Coliseum); In a Land Much Like Ours – receiving a Best Actor nomination at the Buxton Fringe. (Breathe Out Theatre). 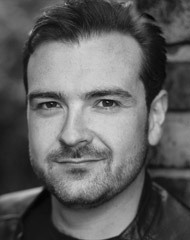 Television and Film credits include: Emmerdale (ITV); Dark Fables, Recourse, Civvy Street (Inner Dark Studios); Fallout (Black Toffee); Peterloo (BFI Film Fund, Film4, Thin Man Films). Andrew trained at Arden School of Theatre, Manchester.